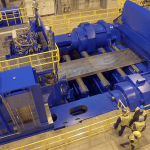 NEW YORK & DAVENPORT, Iowa--(BUSINESS WIRE)--Arconic (NYSE: ARNC) announced today that the installation of its new manufacturing technology – the Very Thick Plate Stretcher (Stretcher) – is complete. The Stretcher produces highly-differentiated aerospace and industrial plate. The investment in the Stretcher is backed by customer contracts, including one with Airbus, valued at approximately $1 billion. The project was completed on time with an investment of approximately $150 million, approximately $40 million under budget. 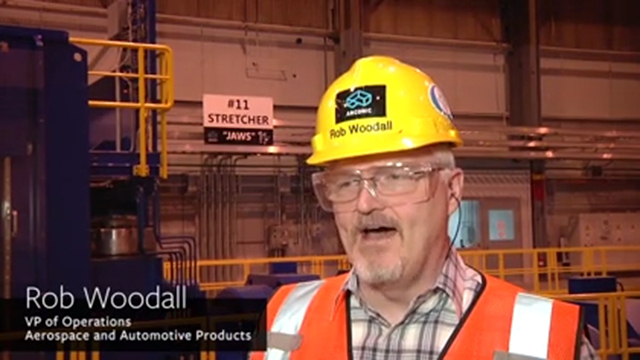 Located at the company’s facility in Davenport, Iowa, the Stretcher improves the performance of thick aluminum and aluminum-lithium plate in aerospace and industrial applications. The stretching process reduces stress introduced into the plate as part of the manufacturing process, resulting in a part that is more easily machined and processed by customers. In aerospace, the Stretcher will not only enable Arconic to service the existing plate market, but also allow airframe builders to make large wing ribs, fuselage frames and bulkheads in new sizes and thickness. For example, one of the challenges composite wings face as they get larger is strength and stiffness, and the aluminum plate from this Stretcher will allow aircraft manufacturers to make aluminum wing ribs to address that issue. In the industrial market, plate from the Stretcher can be used in manufacturing molds and chambers for applications such as semiconductors. Arconic’s Davenport facility is currently commissioning the Stretcher, and has begun qualifying material for its customers. 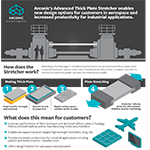 In aerospace, the Stretcher material offers Arconic customers more design freedom and increased productivity. In addition to enabling the production of the largest high-strength monolithic wing ribs in the industry, the material from the Stretcher will also allow aerospace engineers to design aircraft in new ways, because plate of this size and scale is currently not available on the market. For example, Arconic’s Stretcher material allows airframers to create single-piece parts, which eliminates the need to join multiple pieces together, resulting in better production efficiency and lower weight. Product shipments to aerospace customers are expected to begin in the fourth quarter of 2017. Airbus was the first aerospace customer to include material from the new Stretcher in the $1 billion contract announced last year. Stretcher material is also a part of an agreement Arconic has with AMI Metals to support their contract with Lockheed Martin for production of the Joint Strike Fighter. The Stretcher can be used to make some of the thickest, longest and widest plate for plastics manufacturing molds and on manufacturing chambers for the consumer electronics and semiconductor industries. For example, semiconductor manufacturers can use the thicker plate to increase the size of their manufacturing chambers, allowing them to make larger and/or more chips in the same amount of time, increasing productivity and saving cost. Product shipments to industrial customers are expected to begin in the second quarter of 2017. This release contains statements that relate to future events and expectations and as such constitute forward-looking statements within the meaning of the Private Securities Litigation Reform Act of 1995. Forward-looking statements include those containing such words as “anticipates,” “estimates,” “expects,” “may,” “plans,” “projects,” “should,” “will,” “would,” or other words of similar meaning. All statements that reflect Arconic’s expectations, assumptions or projections about the future, other than statements of historical fact, are forward-looking statements, including, without limitation, projections of competitive position, market share, growth opportunities, revenues or other financial items of Arconic; and projections regarding the Stretcher shipments. Forward-looking statements are not guarantees of future performance and are subject to risks, uncertainties, and changes in circumstances that are difficult to predict. Although Arconic believes that the expectations reflected in any forward-looking statements are based on reasonable assumptions, it can give no assurance that these expectations will be attained and it is possible that actual results may differ materially from those indicated by these forward-looking statements due to a variety of risks and uncertainties. Such risks and uncertainties include, but are not limited to: (a) deterioration in global economic and financial market conditions generally; (b) unfavorable changes in the markets served by Arconic, including the aerospace market; and (c) the other risk factors discussed in Arconic’s Form 10-K for the year ended December 31, 2016, and other reports filed with the U.S. Securities and Exchange Commission. Arconic disclaims any obligation to update publicly any forward-looking statements, whether in response to new information, future events or otherwise, except as required by applicable law. Market projections are subject to the risks discussed above and other risks in the market. 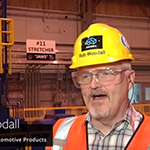 Arconic�s massive manufacturing technology for differentiated aluminum plate is up and running in Davenport, Iowa. 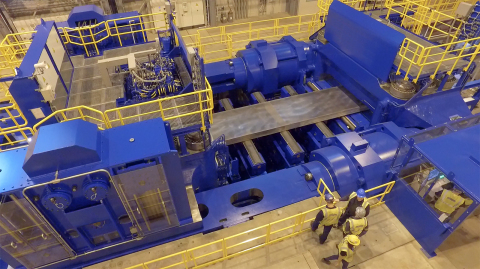 Watch the construction (timelapse) of the Arconic thick plate stretcher, from start to finish, in 92 seconds. The Arconic Stretcher comes online - advanced technology for highly differentiated aluminum plate used in aerospace and industrial applications.